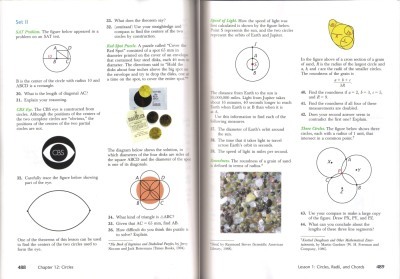 Harold Jacobs Geometry: Seeing, Doing, Understanding (third edition) is a Euclidean geometry textbook meant for a high school geometry course (typically grade 10). I had been wanting to get a copy of this book for years, and I kept looking if I could find a used copy for $10-$20 somewhere. But after several years, I decided that just wasn't going to happen, and got me a used copy for what they generally sell: between $30-$50. That price alone tells you about the popularity of this book. Of course Jacobs' Geometry isn't popular without a reason. I will strive to explain here why people like it so well. First of all, it has to do with Jacobs' writing style: he clearly loves geometry (and mathematics) himself, and writes about it in an interesting and humorous way. Every new lesson starts out with some clever notion of that particular geometric topic taken from real life, often from cartoons. So... it is not written as a "facts book" alone, but as a book that you enjoy reading through, even if you weren't studying geometry. And secondly, the exercises. It is here that Jacobs really exceeds. 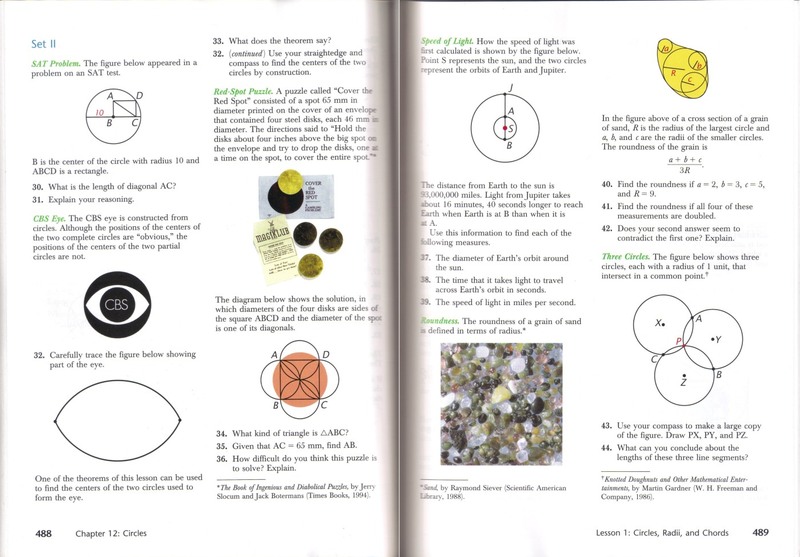 A tremendous portion of the exercises are tied in with real-life examples and illustrations, which makes them more interesting than regular textbook exercises. They often cite old math books or math books from other cultures, or come from art, architecture, nature, illusions, sports, chemistry, geography, astronomy, etc. The exercises proceed from very simple ones that check if you know the terminology to such that really require some thinking, so there is something for everybody. (Even middle-school students can do a portion of the problems.) The third edition of the book is in full color, which makes the exercise sections look like "eye-candy". The back cover states, "Over 2200 new photographs, drawings, and cartoons illustrate new examples and exercises." Below you can see an example of the colorful exercises, often tied to real-life. Click to enlarge the image. Each lesson has three different problem sets. Set I is usually easier than set II. Set III typically includes a challenging problem, often a mathematical puzzle. There are PLENTY of exercises, so students don't have to do them all. 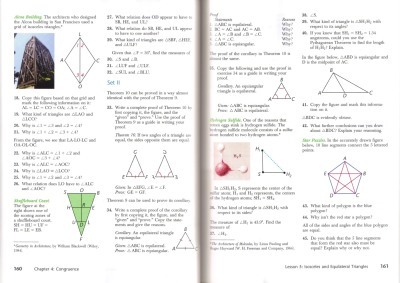 Answers are provided for some set I and set II exercises at the back of the book, but not even for half of them. You should therefore purchase the Enhanced Teacher Guide also. You can view a long preview PDF file on the publisher's website; it includes three entire chapters (scroll down on the page to see the link to it). After each chapter, there is also a review lesson plus an algebra review. It is easy to notice that the exercises rarely ask the student to write a complete proof on his own. Instead, most of the proofs in the exercises ask the student to give the reasons for the statements, or ask why something is this way or that. I am sure that some educators object to this book because of this fact. But, writing complete proofs has always been a big problem for a lot of high school students. Jacobs is NOT omitting deductive reasoning nor proofs... but they are handled in a way that helps students get used to proofs little by little. Besides asking students to complete the reasons for statements in proofs, Jacobs often asks, "What can you conclude about...?" Then there are many, many "why" questions in the exercises. So, a lot of the exercises have to do with deductive reasoning and with proofs, just not asking students often to write the complete proofs. Also, the second chapter of the book is titled "The Nature of Deductive Reasoning". It has lessons about conditional statements, direct proof, indirect proof, and a deductive system. After that, if you look closely, the whole book IS indeed written as a deductive, formal system of geometry that starts form postulates and proves the theorems used (the lesson texts include the postulates, theorems, and definitions). However, I would say that the emphasis of this book is definitely on applications, understanding the theorems, and deductive reasoning, but not on the nature of the deductive system as a whole. In the example pages below, the exercise about Alcoa building and exercise #34 are where the student just gives the reasons for the statements in the proof, whereas problems #33 and #35 ask for complete proofs. Please see also this review left at Amazon, and the a long preview PDF file on the publisher's website (scroll down on the page to see the link to it). I was a bit disappointed how the text handled Pi. The author discusses the limit of the perimeters of regular polygons inscribed in a circle. He says the limit exists and is Pi: "From the table, it appears that N is getting closer and closer to a specific number. The number, its limit, is π." I don't have a problem with the method used as such -- it is mathematically very sound. I just wish the author would have tied this in with what students already have studied about Pi in middle school or algebra. Such as: he could have given the regular definition of Pi before starting to discuss Archimedes's method (Pi is the ratio of a circle's circunference to its diameter), and derived from it the formula for the circumference of a circle. I'm just not sure if students who are not mathematically mature can grasp from the exposition of Archimedes's method that this is how we get Pi. With the area of a circle, I was hoping the author would have dealt explicitly with the approach we commonly see shown informally in middle-school textbooks, which is dividing the circle into sectors, and then considering either isosceles triangles or parallelograms whose total area approaches the area of the circle as the number of such sectors increases. I only say this because students have often been exposed to this idea already. However, these little "lacks" (and I'm sure other instructors can find a few others) do not take away from the tremendous quality of the book! I think Jacobs' Geometry is a highly enjoyable and excellent textbook, and I can heartily recommend it for a high school geometry text. 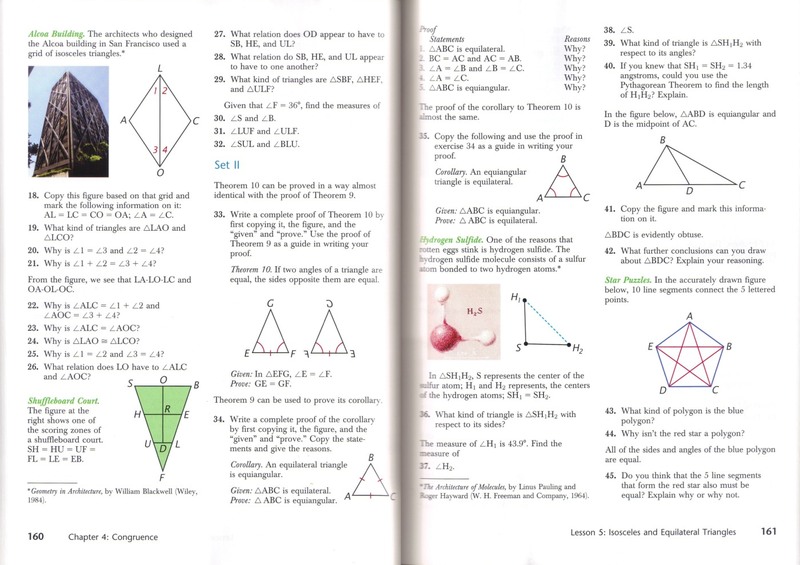 Most parents will probably also enjoy the Enhanced Teacher Guide for Geometry: Seeing, Doing, Understanding, which contains answers to all the exercises (the book itself has some answers at the back, but not that many). The Teacher's Guide includes Lesson plans, blackline transparency masters, answers to all exercises, plus 25 Geometer's Sketchpad projects. Also, Ask Dr. Callahan company sells a DVD with video lessons that accompany Jacob's book. A few advanced mathematics students could benefit from studying a more "rigorous" geometry text. By that I mean a text that puts more emphasis on writing proofs. But, Jacobs text doesn't have to be a bad choice even for those students because it does also have challenging exercises. Also, another great textbook that I have reviewed is Geometry: A Guided Inquiry. For that book, you can purchase a home study companion which uses Geometer's Sketchpad. In fact, I'll probably find it hard to choose between that and Jacobs' text for my children when they get to that level. Update as of 2017: Now, Jacobs's Geometry is printed by New Leaf in its Master Books series. You can view the entire chapters 1, 8, and 16 in a massive PDF sample they offer. The company also sells a digital download version. Price: about $91 new, about $40 used.